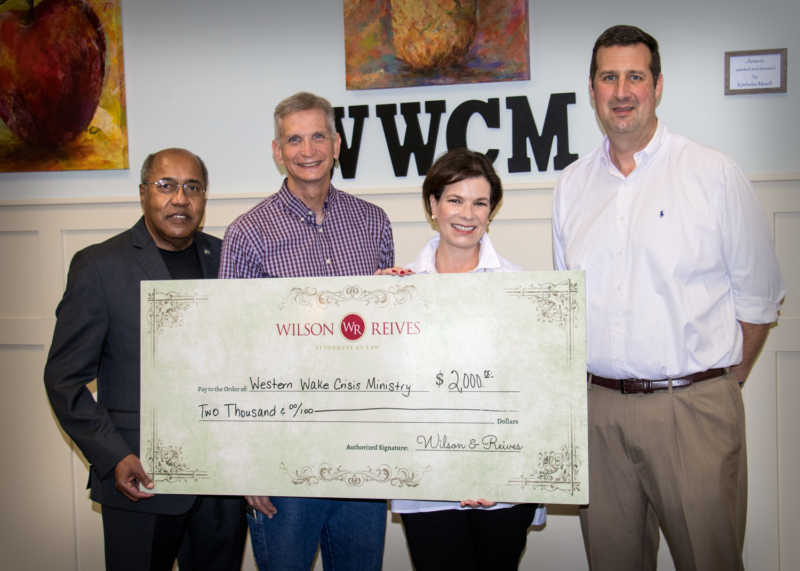 SANFORD, NC & APEX, NC – Local legal firm Wilson, Reives & Silverman recently made a $2,000 donation to local organization Western Wake Crisis Ministries. Western Wake Crisis Ministries was founded in 1983 by local churches and community members with the aim to help families in need. Now, the outreach organization helps more than 200 Apex families each month with temporary or long term needs arising from a crisis. Wilson, Reives & Silverman raised $1,000 during Apex Peakfest through giving people the opportunity to “dunk a lawyer” in a dunk tank for $1. They matched the amount raised to donate the $2,000. “Thanks to all those who came to our booth at Apex Peakfest. Your donations totaled $1,000 and we are pleased to match that bringing a total donation of $2,000 for Western Wake Crisis Ministries,” said Robert T. Reives, II. Wilson, Reives & Silverman is a local legal firm serving Apex, Sanford, and surrounding areas. The full-service law firm specializes in personal injury, workers’ compensation, and criminal defense cases while also offering assistance in areas including criminal law, civil litigation, and more. The team at Wilson, Reives & Silverman is passionate about community outreach and is proud to serve their local area. As part of their booth at Apex Peakfest, the Wilson, Reives & Silverman team committed to match donations received for Western Wake Crisis Ministries. The donation was given to WWCM on May 19, 2017. More information can be found at wwcm.org and wilsonreiveslaw.com. The attorneys at Wilson, Reives & Silverman have 75+ years of combined legal expertise and specialize in personal injury, workers’ compensation, and criminal defense.